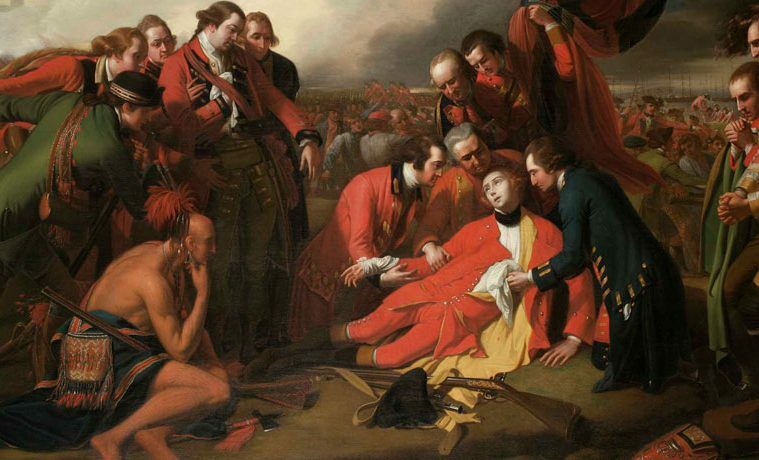 IMAGE ABOVE: Benjamin West, doctor The Death of General Wolfe, click 1779, oil on canvas, Ickworth, National Trust, Suffolk. Image © Hamilton Kerr Institute, Fitzwilliam Museum, University of Cambridge. Surprisingly few paintings by Benjamin West and John Singleton Copley make it into the Museum of Fine Arts, Houston exhibition American Adversaries: West and Copley in a Transatlantic World, considering the show’s epic scale. This is not a complaint. Rather than survey the friends-turned-rivals’ careers, MFAH curators Emily Ballew Neff and Kaylin H. Weber have instead honed in on the two American masterpieces that established contemporary history painting – West’s The Death of General Wolfe (1770, 1779 version) and Copley’s Watson and the Shark (1778) – and contextualized them from seemingly every possible angle. Although the show includes paintings, prints and drawings by its stars’ contemporaries, including some of West’s students, it’s no mere West, Copley and Their Circle. After introducing the London milieu in which they thrived – West starting in 1763; Copley after abandoning a successful career as a Boston portraitist in 1774 – the exhibition toggles back and forth between the Americas (from Quebec to Cuba) and Europe to unpack the artistic influences, scientific discoveries, economic forces, geopolitical upheavals and migratory patterns that helped shape West’s and Copley’s greatest history paintings and maximize their profitability. Artifacts – from a shark’s jaw to Native American garments depicted in West’s painting – further set the scenes. Many come from the British Museum, which was founded shortly before West’s arrival in London. This approach yields three especially salutary results. One is that, in contrast to the tendency of many historical exhibitions and permanent-collection displays to ignore or downplay the presence of people of color in European paintings, American Adversaries devotes serious real estate to the context and implications of the Mohawk in The Death of General Wolfe and the black sailor in Watson and the Shark. It acknowledges how imperialism and race fascination affected the paintings’ enthusiastic receptions and surrounds West’s and Copley’s works with other artists’ representations of Native Americans and people of African origin or descent. 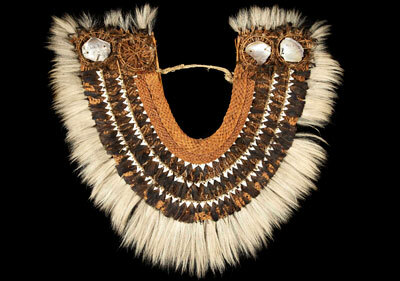 Unknown maker, Taumi Gorget, 18th century, coir, plant fiber, dog hair, shark teeth, mother-of-pearl and feathers, Hunterian Museum, University of Glasgow. Image © The Hunterian, University of Glasgow 2013. Another is that, rather than experiencing The Death of General Wolfe and Watson and the Shark as standouts amid a hit parade of Wests and Copleys, viewers spend much of the show preparing to get the most out of their encounters with these great paintings, often in surprising ways. 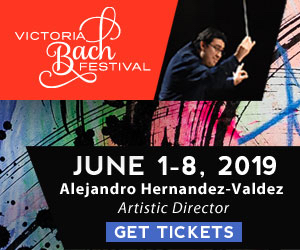 A West-Copley show isn’t where you’d expect to find an exquisite 16th-century Parmigianino drawing, a spatula-like tool with sharks’ teeth, or a casta painting from New Spain depicting miscegenation among the colony’s racial groups, but they’re all here. Itself the result of considerable scholarship, American Adversaries is a rare show that equips viewers to study two important, complicated paintings in the kind of depth they deserve. The third result is that, while giving viewers a taste of what they’re used to in historical shows at the MFAH – glimpses into how the one-percent of yesteryear lived, seen here in a room evoking West’s conspicuously fabulous London studio-gallery – Neff and Weber make time for more bottom-up concerns. The Death of General Wolfe is famous for its title figure’s striking Pieta reference and related ways West gave history-painting gravitas to a canvas depicting a then-recent historical event (the French and Indian War), so the curators rightly establish his deep knowledge of history and religious painting, presenting works by the likes of Titian and Peter Paul Rubens from West’s collection, which also included contemporary paintings and Native American artifacts. But they’ve hung the masterpiece itself in a gallery devoted to what historian Richard White has called the “middle ground” – a short-lived hybrid Native American-European culture symbolized by the scene-stealing trio of figures on the left: a seated, contemplative Mohawk; a ranger, who wears both European and Native American accoutrements (real-life examples of which are in nearby cases); and a Scottish Highlander. Attributed to Jose de Alcibar, 6. De Espanol y Negra. Mulato (6. 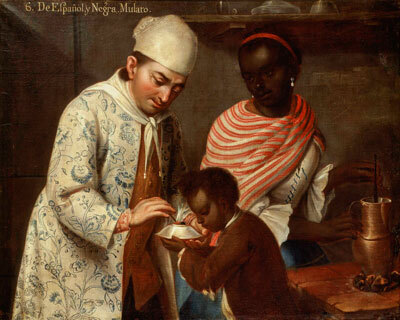 From Spaniard and Black, Mulatto), c. 1760–70, oil on canvas, Denver Art Museum, Collection of Frederick and Jan Mayer. Image © Denver Art Museum. West’s 1776 painting Colonel Guy Johnson and Karonghyontye (Captain David Hill) and portraits by George Romney and Gilbert Stuart of Joseph Thayendanegea Brant, a Mohawk who was related to Johnson by marriage, represent a small, doomed “world of cross-cultural understanding, in which European and Native men sought similar political objectives, wore the same items of clothing, and used the same material objects,” writes catalogue contributor Janet Catherine Berlo. Watson and the Shark also emerged out of a mix of Old and New World influences and historical currents. A section outlining Copley’s European Grand Tour, which exposed him to the sites and masterworks he needed to study to transition from provincial portraitist to a history painter who could compete on an international stage, precedes another room devoted to the New World, from Havana seascapes to representations of shifting 18th-century black identities. 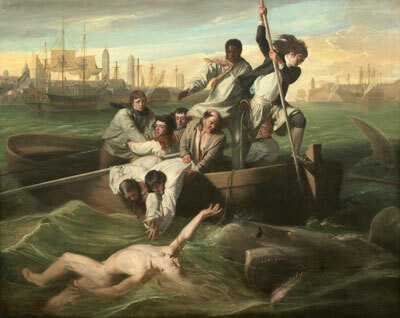 Watson and the Shark, a riveting depiction of a shark-attack rescue in a Havana harbor that was commissioned by the survivor to commemorate his youthful ordeal, hangs here. Neff explores how Watson’s mysterious black sailor – a late addition to the painting, as studies make clear – resonates with such contemporary figures as Olaudah Equiano, an abolitionist and former slave who bought his freedom by working as a seaman. Amercian Adversaries, which also includes a denouement confirming that Wolfe and Watson were high points in eventually sputtering careers and a selection of the prints that made the artists more money than the paintings they were based upon, also evokes open-ended possibilities – all the more remarkably so for a show about two paintings. 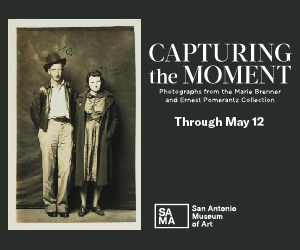 It represents an invigorating approach to historical exhibitions, one I hope catches on in Texas museums.